This wiring discussion assumes that you have no schematic for the radio, or no information for the mike. 1. Determine which pin on the radio’s mike socket performs which function (TX, RX, Audio, Ground) on the CB itself. 2. Determine which color wire on the new or repaired mike performs that same function. 3. Be able to neatly solder and insulate those wires on the corresponding pins of the new plug. Before you even start, you must know if the CB uses relay or electronic switching between TX and RX. The obvious way is to look at the main chassis for a relay. Or while listening to a signal, unplug the mike. If you can still hear something, it’s relay switched. If the speaker goes dead but the S/RF meter still shows a signal there, you have electronic or diode switching. If your CB only has a 3-pin mike socket (Pearce-Simpson, some Robyns, etc.) this is a dead giveaway that the CB is relay switched, because electronic switching requires at least four wires. Since diodes are cheaper than relays, nowadays almost all CBs use them. Some old 23-channel AM, all old 23 channel SSB, and the first generation 40 channel SSB (Cobra 138/139XLR, etc.) used relays. Today all rigs use electronic T/R switching to save production costs. Relay switching is generally easier to wire up, because you only need three connections: Mike Audio, Ground, and the TX Keyline that energizes the relay when Grounded. Electronic switching uses four wires: a common Ground, Mike Audio, TX Keyline that switches to TX when Grounded, and RX speaker line that opens the speaker on TX to prevent feedback squeal. These three or four connections are regardless of the number of pins on the CB socket. For example, if your CB has one of those female 5-pin or 6-pin DIN type sockets, only three or four of the pins are actually used. Manufacturers use the cheapest parts they can find. If they got a good deal on a million DIN sockets they’ll build the radios with them, instead of the superior 4- or 5-pin male socket with threaded coupling nut. To begin, figure out which pin on the mike socket does what. You’ll need a real antenna or a Dummy Load, a clip-lead or a piece of bare wire, and possibly an Ohmmeter. WARNING: Turn the radio off when using an Ohmmeter; you can blow the meter by accidentally applying voltage to it on a Resistance scale! 1. Use the Rx1 resistance range. Attach one test lead to the BLACK power wire coming from the CB or slide mount, or the [–] pin on the DC socket of a base station radio. On a base station where the DC power socket isn’t stamped with [+] and [–] symbols, you’ll have to remove the cover. The inside of the DC socket will often use the standard RED [+] and BLACK [–] wires to the chassis to guide you. 2. Leave one Ohmmeter lead on the BLACK or [–] wire or pin. Touch the other Ohmmeter test probe to all the mike socket pins. You’ll find one or two pins that make the meter deflect all the way over to 0W. That indicates a DC short (i.e., continuity) between the BLACK power lead and the socket pin you’re testing. In other words, this is the Ground. On a DIN type socket, the holes are too small to get the test probe into, so you’ll need to jam a bare wire into the socket holes as you proceed. Or probe from the inside of the socket if you can reach the connections on it. OK, you’ve already found the Ground or “common” connection. Immediately draw a sketch of the socket, using its notch as a reference point. Mark the common Ground lead you just found. 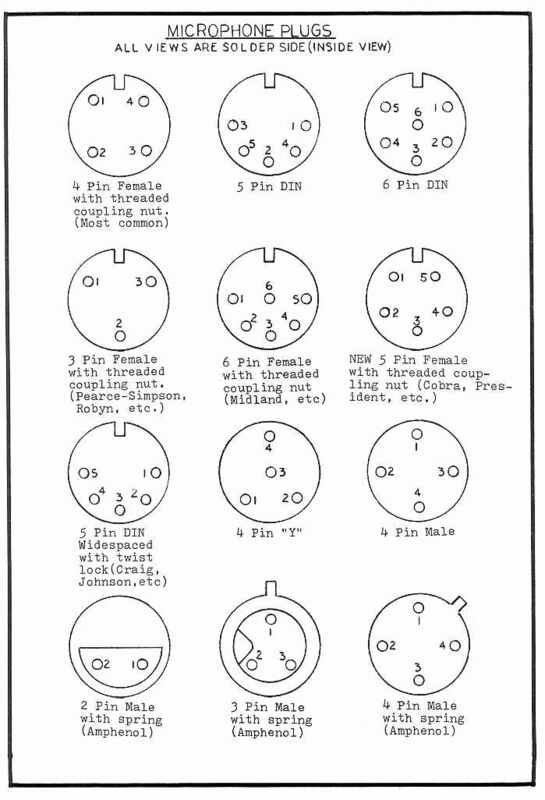 Figure 1 shows the pin numbering for many of the most common CB mike sockets. Note: When probing with a VOM on the mike pins of an electronically switched radio, you may touch one pin that makes a small crackling noise in the CB speaker. And it shows a few ohms of resistance. This is an obvious indication for the RX line. Mark it on your sketch. You can also confirm this in Step #4 below. 3) Remove your Ohmmeter and turn on the CB. Now attach a clip-lead or a piece of bare wire to the common pin you found in Step #2. Start touching the other end of the wire or clip-lead to the remaining pins briefly and watch what happens. · hearing a dead carrier on another CB tuned to the same channel. This is the TX line. Write it down. If you hear a squeal or buzzing sound, release the wires; you’ve either found the Audio (Mike) line, or shorted the Mike line to the speaker (RX) line. Assuming you found the common, the RX, and the TX in the steps above, the only thing left on the typical 4-pin socket must be the Audio or Mike line, so you’re done! On a 5- or 6-pin DIN socket, finding the Mike line will be slightly harder. You’ll have to first find the TX line, as described above. Listen on another CB tuned to the same channel while you touch the remaining socket pins with your fingers. Then key the CB you're trying to wire; you’ll find that touching the Mike or audio line causes a slight hum to be heard on the dead carrier when listening on the other set. 5) In a relay switched CB, jumpering the common with the correct pin will key the TX. You can then use the hum/fingers method above to find the Mike line. Some older relay switched rigs used a small shielded cable between the mike socket and main chassis, a dead giveaway that those are the Mike line and Ground. The newer generation (Cobra 148GTL, Uniden Grant, Galaxy, RCI, etc.) uses electronic switching exclusively (diodes are cheap! ), and generally have 4-, 5-, or 6-pin mike sockets. Only 4 wires are needed but bigger sockets often mean that more than one pin may be grounded. In those models one ground is the common circuit ground and the other is the earth or cabinet ground. This helps to break up potential ground loops which can cause squealing or other stray oscillations. In any case, only four wires are actually needed. Some models include extra wires and pins for remote control functions such as CH. UP/CH.DOWN switching. Without a VOM, you’ll have to use trial-and-error wire jumpering. For electronic switching this is exactly the same as described above but without the benefit of already knowing the common connection. Start by jumpering any two mike socket pins together and see what happens. Suppose they key the TX. Draw another sketch and mark both those pins. Continue jumpering around until you hear a normal receive signal in the speaker. Note those pin numbers. You’ll discover that one of those pins is common to both RX and TX. For example, if pins 2 and 3 cause TX, and pins 2 and 4 cause RX, then obviously pin #2 is common (ground) to both functions. Therefore, #3 is the TX line, and #4 is the RX line. This leaves only pin #1 remaining, which must be the Mike line. (By the way, this just happens to be the pin numbering for all Cobra radios.) The word “common” as we’re using it means the same thing as Ground or shield wire. Now start touching the loose end of the clip-lead to the mike socket pins until it keys the TX. Write it down. Then use the hum/fingers method above or look inside the radio to see if there’s a shielded audio cable. By the way when looking inside the radio, you can just as easily find the common or Ground by noting which pin the shield of that audio cable is attached to. On a 4-, 5-, or 6-pin socket that’s relay switched, those remaining pins are either unconnected, or possibly also grounded. If grounded it means that more than one combination will key the TX. Sometimes you need all four pins of the mike socket even though it’s a relay switched CB. (E.g., SBE Cortez.) In these rare cases, there will be voltage to ground on two pins instead of just one; touching either of those pins to common will make the lights go out or blow the fuse. In this case you need a separate set of mike switch contacts to wire it right, but most power mikes can be arranged this way. The typical power mike will have three, four, or five colored wires and a shield braid. If one of the colored wires is obviously covered by the shielded braid, it's the Mike or audio line. Otherwise if you cut back an additional inch or so from the main cord cover, you’ll most likely see one wire that’s wrapped with the shielded wire. Following are some typical examples. Touch one lead of the Ohmmeter (Rx1 scale) to the shield braid and the other lead to each color in turn. One color should show a short; i.e., 0W, when not keyed and open continuity when it is keyed. This is the RX line. Write it down. Another color should show a short (0W, or continuity) with the mike keyed, and open with the mike button released. This is the TX line. The remaining color is obviously the Mike or audio line. If you couldn’t seem to find the TX or RX line this way, the mike is wired internally for relay switching. It will short two of the three colored wires on TX, rather than one color and the shield braid. See below. 1. On a standard dynamic mike (not a power mike), the audio line will normally show a DC resistance of about 300W-1000W between the shield and Mike line when keyed, on the Rx10 or higher scale. (You may also see this in the unkeyed position.) This is definitely the mike audio line, as the TX and RX lines will show DC resistances of 0W. 2. On a power mike with the battery installed, the resistance may vary anywhere from a few ohms to several thousand ohms, depending on the setting of its gain control. Many times when keying it you’ll see the Ohmmeter kick up, then slowly settle down to a set value as the capacitors in the mike amplifier charge up. Note: Many power mikes will show a mike line reading of a few ohms all the time until you key it. This indicates a normally closed audio line, a very undesirable feature. (A meter on the mike line will jump when you key it.) A normally closed audio line can be a real problem to wire to many CBs. It’s usually done because the manufacturer was too cheap to use a switch with enough contacts on it to begin with. Ideally the mike line should make a complete circuit only when you key it. All Turner mobile mikes work this way. If you found the mike line OK, but couldn’t get an indication of TX and RX continuity between the shield and one particular color, you have a mike that’s wired internally for relay switching. A quick Ohmmeter check after you find the mike line will reveal that you get a complete circuit (continuity) between the two remaining colored wires, rather than one color and the shield. 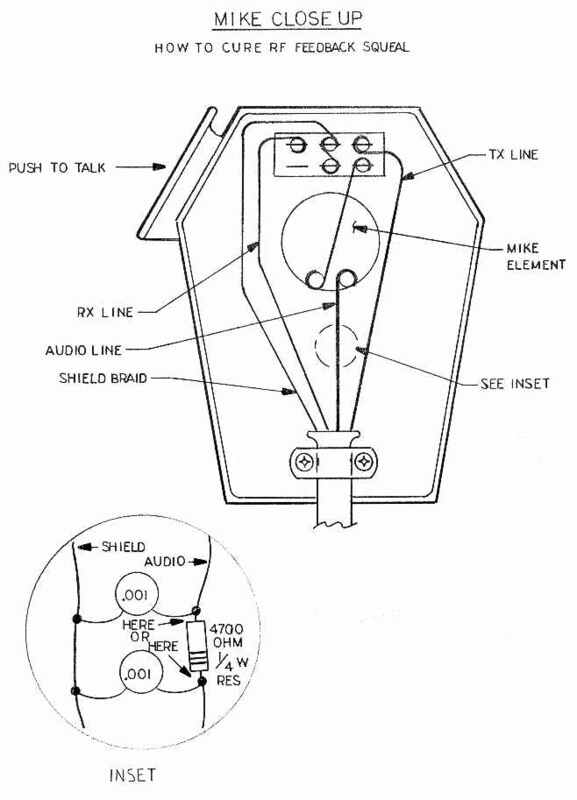 On many mobile and most base power mikes, there’s a miniature slide switch inside the mike or the base plate marked “E” and “R.” Put it in the “E” for electronic position, and it will then show TX and RX continuity between shield and colored wires. We suggest you do this even if your CB uses relay switching. You can wire 99% of all CBs that use relay switching in the electronic position. But the reverse is not true; a mike internally wired for relay switching must be modified to use it on electronically switched CB radios. Note: Turner mobile mikes don’t have the internal switch, although some of their base mikes do. If the Turner mike starts with the letter J, like JM+2, JM+3, etc., you’re all set up for electronic switching. Nowadays Turners all come with 5-wire cables since relay CBs are a thing of the past, and with them the old 3-wire mike cables. Generally speaking, it’s much better to buy a mike wired for electronic switching. It can be easily rewired to use on another CB later just by stripping either of the switching wires and twisting it together with the shield as a single wire. The remaining color then becomes the TX line for relay switched radios. You’ve reduced the four wires down to three and saved the hassle of having to open up the mike and rewire the switch itself. Step #1: Identify the Mike or audio line. This will have the shield wrapped around it. If it doesn’t, cut back another inch or so of covering; you’ll find it. If not, use the previously described Ohmmeter method. You’re looking for the wire that shows a kick (power mike) or a fixed resistance reading (standard mike) between it and the shield when keyed. Step #2: It’s very unlikely you’ll find any continuity between shield and the remaining non-audio colored wires. Use your Ohmmeter to touch the remaining three colors with both test probes. You should discover that two of the three colors will short (show continuity) when keyed, and two of the three will short unkeyed. One of those three colors is common to the other two colors, in exactly the same way we found the common on the mike socket itself. · connect RX or TX at the proper time. · connect the audio line, ideally only when keyed. · connect the power mike battery only on TX, so battery won’t drain except when being used. In many cases, installation of a resistor of about 4.7KW or more in series with the mike line will cure this problem. This would be installed exactly the same way as the RF feedback squeal filter described below. You may have to experiment to find the proper value resistor. You’ll probably notice a slight decrease in receiver volume if it becomes necessary to resort to this method. Use the smallest value resistor that will prevent the RX from going dead or squealing. The mike should then work normally, and you probably won’t even notice the volume decrease. If you experience this problem when trying to wire certain brands of mikes, it’s possible the mike just can’t be wired to that particular CB. For example, the Astatic D-104 “lollipop” mike with the TUG-8 base stand uses a double pole, double throw T/R switch. If you had this wiring problem with such a mike, you couldn’t wire the CB to it. Instead you’d have to buy the TUG-9 stand, which uses a triple-pole, double-throw T/R switch. (And is also more expensive.) This problem is very rare though, and happens in maybe 5% of all mike wiring/CB combinations. Note:Don’t confuse this with the “Talkback” feature of many newer CBs. Those models are specifically designed to let you hear yourself in the speaker so you can adjust an Echo or some other audio feature in the radio. Feedback squeal is a very common problem. If the mike is correctly wired and there are no broken wires in the plug or cord, the squeal is usually being caused by RF feedback. Fancy name, easy solution. Often the stock mike works fine, and the squeal only starts when you try to wire up a power mike. There’s nothing wrong with the mike. RF feedback means that some of your TX energy is getting back into the audio or modulation circuit of the CB. It starts a continuous cycle of oscillation or feedback, just like a PA system with the mike too close to the speaker. The most common causes are poor RF filtering in the CB, or high antenna SWR. The cure is cheap and simple. 2. After finding the audio line, cut it at a convenient spot and insert a 4700W (4.7KW, YELLOW-VIOLET-RED), 1/2-watt or 1/4-watt resistor in series with the audio line. See the inset in Figure 3. 3. For extra filtering protection, also connect a .001µF or .01µF ceramic disc capacitor from either side of your resistor/audio line connections to the bare twisted shield (Ground) braid of the mike cable. The value of these parts isn’t very critical; just get the physically smallest ones you can find, like a 1/2-watt or 1/4-watt resistor and a 50-Volt capacitor. These will easily fit inside the mike. Solder and tape all your connections. (Please, no Scotch Tape!) These parts together cost about 50p, and will prevent RF energy in the TX circuits from getting back into the mike. This works 99% of the time. If adding the resistor only partially solves the feedback problem, you can try using a small RF choke instead. Values of about 470µH-1000µH work well and won’t affect the audio quality. Get the miniature epoxy type of RF chokes, which actually look like a 1-Watt resistor and even have a 4-band color code on them. If filtering the mike doesn't fix the problem, also check your antenna by substituting a Dummy Load. If the squeal disappears, it was caused by high SWR, which causes excess RF energy to flow back into the radio. The cure is obvious: tune or fix that antenna! In order to wire mics you need a basic understanding of how they work. 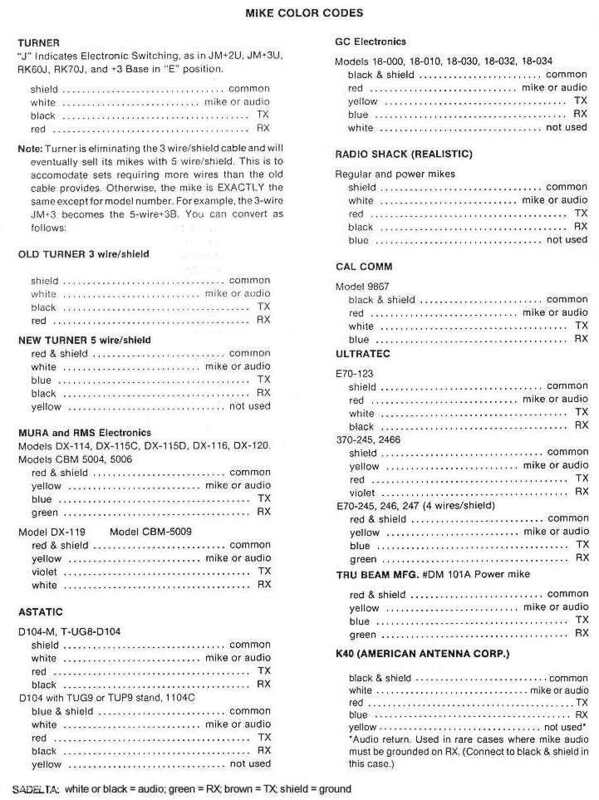 The books tell you the color codes for many mics and which pins to solder them to on the connector for a given radio. But what if the mic is on it's third cord, who knows what color code the last owner used, and what if your brand of mic isn't listed. THERE IS NO STANDARD COLOR CODE. Astatic, Cobra, Turner, and Generic mics all have different color designations for each wire. For example, the red wire on an Astatic mic is the Transmit wire, on Turner mics it's the common, and Cobra uses it for the audio lead. The purpose of this tutorial is to give you the means to figure out which function each wire is serving when you don't know the color code. All you will need is an Ohm Meter or continuity checker, if you don't have either of these you should be able to open the mic and see where each wire is connected to the switch. This tutorial applies to the vast majority of 40 Channel CB radios made in the last 20 years, with electronic switching. There may be rare exceptions and this does not apply to most of the old 'relay switching' rigs. Displayed is the common five wire microphone. This mic is shown with the PTT (push to talk) button released, and the radio in receive mode. The audio wire is always wrapped in the shield (bare wire), COOL, we've already figured out 2 of the wires. With your ohm meter check the 3 remaining wires, check 2 wires at a time until you get continuity. The remaining wire you aren't testing is your transmit lead. Now you must key the mic, press the PTT button in and hold it, a rubber band works, or have someone hold it for you. Check for continuity between the Transmit wire and the two unidentified wires one at a time, whichever wire reads continuity with the TX wire is the Common lead, the other wire is Receive! But my mic has 6 wires! It most all cases the 6th wire is not used, cut it off short enough so it won't short out against any of the pins on the mic connector. Hey my mic only has 4 wires! The shield wire is used as the common. My mic does have 5 wires, but my connector only has 4 pins!! In this case solder the common and shield wires to the same pin on the mic connector.